Imagine walking into a gallery in New York City and buying a painting. An obscure work, thought to be 19th Century German. It’s a well-made portrait, but nothing special. Then, after careful analysis and the lucky uncovering of a fingerprint, the truth is uncovered: for $19,000 you could have bought an original work of Leonardo da Vinci, the famed Renaissance artist, architect, inventor, and all-around creative genius. 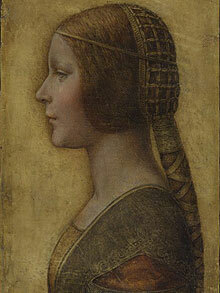 Such is the tale of a painting now called “Profile of La Bella Principessa,” a painting by da Vinci of Bianca Sforza, daughter of his patron Ludovico Sforza, the Duke of Milan. The painting dates from 1496 and is estimated to be worth several hundred million dollars. The work was painted on animal-skin vellum for the cover of a book of poetry dedicated to Bianca. All the credit for saving the work goes to New York art dealer Peter Silverman, who first figured out that the painting wasn’t 19th Century German, and who undertook the long and arduous process of figuring out just who painted the mystery girl. He consulted with experts from around the world, devoted hours of research into the students of Da Vinci, and consulted with Lumière Technology in Paris for the high-tech spectral analysis that was icing on the cake. All that work, and he doesn’t even get to keep the painting!